Sustainable glasshouses that tackle water and soil degradation are being designed by the University of Sheffield in an attempt to tackle limited food availability and soaring food prices in the Middle Eastern country of Oman. The pioneering design incorporates various technologies developed at the university to help crops grow, including solar power to convert seawater to freshwater, and hydroponics systems which use foam instead of soil. 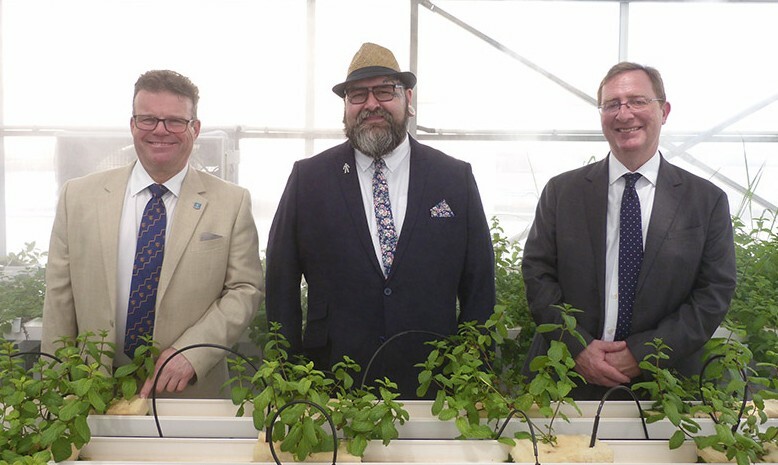 The first greenhouse, which was launched at the University of Sohar in Oman on 13 March, has been developed as part of a collaboration between the two institutions. Researchers at the University of Sheffield were approached to construct a greenhouse that cools rather than warms and can deal with issues like a lack of water and soil degradation – a massive problem internationally, particularly in the Gulf. Protected growing in greenhouses is already widespread in Europe and enables the production of a range of high-value crops including tomatoes, cucumbers, peppers, salad leaves, herbs and also soft fruits and flowers. However, current designs have a number of issues, in particular high demands for water and energy, and potential for environmental problems through fertiliser and pesticide runoff. They are also unsuited to the particular environmental conditions of the Gulf region, with extremely hot weather in the summer and the limited availability of fresh water. Scientists have designed the greenhouse in Sohar so that plants are supported artificially and suspended away from the ground. Using foam made in labs in Sheffield as the artificial material eliminates the need for soil, and it holds nutrients and water around the plant roots rather than allowing it to run off like it does in soil. Duncan Cameron, professor of plant and social biology at the University of Sheffield, who has helped lead the project in Oman, said: “Geographically Oman is a difficult country. It reaches highs of 50 degrees in the summer with 65 per cent humidity and struggles to grow anything. This leads to food prices quadrupling in the summer. The greenhouse, which is 150m2, will be used as a research facility, demonstrating the potential to produce vegetables, herbs and fish.